If your team needs a goalie for the regular season you may contact the goalies in the Backup Goalies Directory below (for the playoffs please see the playoff rules in the rules section). Or Rent-a-Goalie (their dispatch hours* are every day at 8:00 AM-7:00 PM and then text message after their dispatch hours). Or Sports Rent and rent a set of goalie equipment, that any of your players can use to play goalie, before they close (their hours* are Monday-Sunday at 6:00 AM-10:00 PM). *Please check their website for their up-to-date hours. In the event of an unfortunate no-show (or out-of-date contact info) by any of the goalies in the Backup Goalies Directory below please contact us at info@cahl.ca so that the goalie may be removed (or updated) from this directory. Contact the goalies in the Backup Goalies Directory below at your own choice and risk. 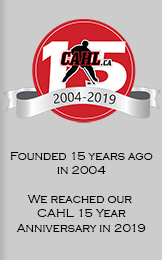 The CAHL is not responsible for, however not limited to, any of the goalies' actions or inactions of any kind before, during, or after any game, on or off the ice, or their attendance, skill, or performance. If you would like to be in the Backup Goalies Directory please complete and submit our online CAHL Waiver form. In the form under the heading "Team" please put: "Backup Goalie, Div Preference, Cell Phone" (if you want your cell phone listed). Your name, email and/or cell phone, and division preferences will be listed below. Please email via BCC (blind carbon copy) if you are emailing all of the goalies at once. Please select all of the emails below, then copy, and then paste into your email BCC field.